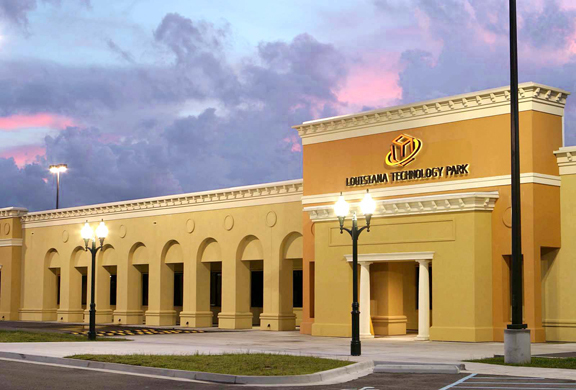 TECH TOGETHER: Conversations are taking place that would have the Technology Park partner with LSU’s Innovation Park since both have similar missions. 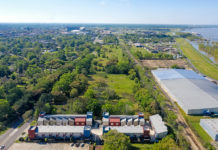 The new year will bring change to the Louisiana Business and Technology Center at LSU’s Innovation Park, and the Research Park Corporation’s Louisiana Technology Park at Bon Carre, two entities that have similar missions and, were once, bitter rivals. Those days are gone, and a jointly-funded study—expected to be released early this year—is underway to examine areas where the two could work together more closely. In an indication of how serious these efforts are, the RPC recently contributed $200,000 to help fund new road construction at the rapidly expanding Innovation Park, so don’t be surprised to see the RPC build something on the site at some point. It won’t all be a big love fest, however. These changes come as the LBTC’s founding director Charlie D’Agostino steps down after 30 years. 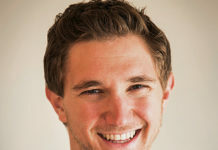 Given the political culture that defines LSU and the one-time rivalry between the LBTC and the RPC, D’Agostino’s capable successor, Dave Winwood, will have to prove he’s as adept at playing politics and navigating his way into the old boy’s network of Baton Rouge’s business community as he is at building entrepreneurial ecosystems. Though national experts predict new vehicle sales will drop 1.1% in 2019, here in Baton Rouge the expectation is for the market to finally right-size after slumping the past two years. Much of the downward trend has been blamed on the surging number of sales following the August 2016 flood. In other words, with so many vehicles sold in the last half of 2016, demand has since been down. Expect some 30,000 new vehicle sales in Baton Rouge this year as the normal trade cycle wraps its third year in August. 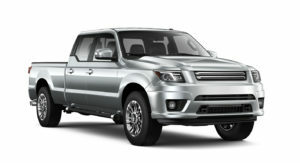 Chances are most of these sales (as much as 70%, according to national estimates) will be light trucks, such as pickups, crossovers and SUVs. 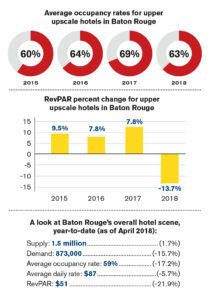 Occupancy at Baton Rouge’s high-end hotels will likely taper off this year, with the city’s six hotels classified as “upper-upscale” prior to April 2018 collectively averaging closer to their normal 60% rate after an unusually high 2017. 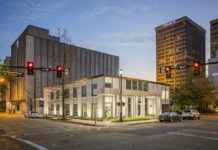 Those same hotels—The Hilton Baton Rouge Capitol Center, The Watermark Baton Rouge, Hotel Indigo, Baton Rouge Marriott, The Renaissance Hotel Baton Rouge, and Embassy Suites by Hilton Baton Rouge—should also see revenue per available room, or RevPAR, leveling out. 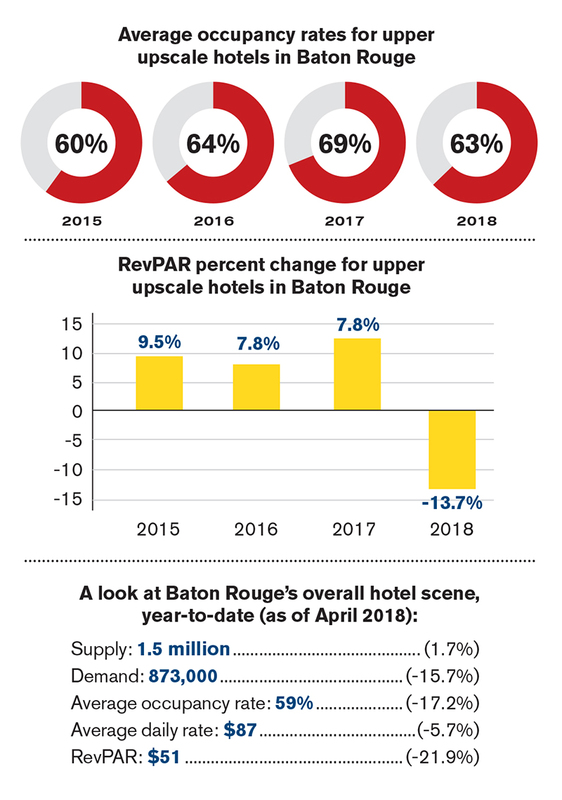 Yet the high-end hotel market should still fare better than Baton Rouge’s overall hotel scene, which has consistently seen occupancy and RevPAR dip as supply outpaces demand and more hotels emerge in Ascension and Livingston parishes. 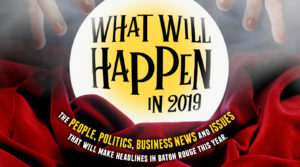 After 15 straight months of declining revenues at Baton Rouge’s three riverboat casinos, 2019 could be the year that economist Loren Scott’s prediction comes true, which is that the city, unable to support three casinos, will lose one. The Belle of Baton Rouge may be most likely to succumb to such fate. The Belle has seen the steepest revenue declines of the three, and its parent company indicated in November it is no longer interested in upgrading the facility, diminishing hope of a revival.